Creating Magical Wedding Photos in a Fairy Tale Setting. As you plan your special day, your wedding photography is a big priority as it captures the wonderful memories that you will enjoy for years to come. As many brides and grooms know, finding the right photographer is a very important task that requires getting the right “marriage” of photography skills, artistic style and personality. And equally, finding the right location can really set the tone of your wedding photos – as well as give you peace of mind that you won’t have to worry about getting caught outdoors in inhospitable West of Ireland weather! 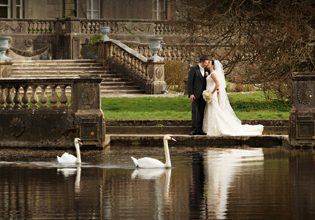 Westport House & Grounds provides a timeless and stunning backdrop. You’re covered no matter the weather as it includes the use of the inside of the fairy tale house and the immaculately-groomed grounds for one set fee for wedding photos. The grounds provide waterfalls, iconic bridges, ancient trees, stone terraces, sun houses, naturally blooming gardens as well as lakeside shots. And the house offers the front steps, marble staircase with the angel of welcome overlooking, the cosy library, pretty morning room or even the master suite of the red bedroom. In the words of a recent bride, “the house – with its timeless appeal – proved to be an amazing back-drop for capturing our big day” and you’ll enjoy looking back on the memories for many years to come. 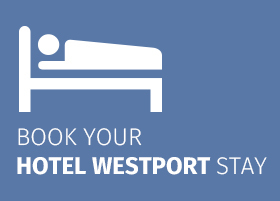 Usage of both Westport House and Grounds for your wedding photo costs €200 for the session. For couples booking the historic house itself, use of the interior of the house for photos is included in the venue hire. For couples booking the Farmyard or Hotel Westport for their special day, use of the grounds for photos is included in your wedding package. If you have any other questions or would like to book your wedding photos, please contact Westport House at info@westporthouse.ie or 098 27766.